Customize ME head morph within Blender. added a couple of hairstyles. You can switch between them by selecting different layers. uploaded a version in .fbx format which can be imported to editors other than Blender. Materials in it are going to be a mess though. - added a couple of hairstyles. You can switch between them by selecting different layers. - uploaded a version in .fbx format which can be imported to editors other than Blender. Materials in it are going to be a mess though. Customize ME head morph within Blender. I'm not completely sure that the morph created this way would be identical to what the game will produce, but i tried recreating a morph from one of my saved games and result looked very accurate. 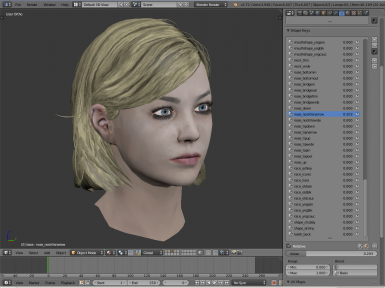 Blender version 2.77a was used to create the file. Older versions might work as well, as long as they support shape keys.